The Baltimore Ravens defended their home turf at M&T Bank Stadium Monday night, defeating the Houston Texans 23-16. QB Joe Flacco struggled statistically through the air, throwing for only 141 yards on 32 attempts. He had no turnovers but also no passing touchdowns, however he did have a 25-yard rush late in the fourth quarter that sealed the game for the Ravens. QB Tom Savage was more prolific through the air, going 22-of-37 for 252 yards, but he also threw two picks on the night, including one on the fourth-quarter drive that would ultimately cost the Texans the game. RB Lamar Miller struggled to find room on the ground, rushing for 51 yards on 17 carries. Defensively, both Baltimore’s Terrell Suggs and Houston’s Jadeveon Clowney had good nights, both coming away with at least one sack. With that, we give you our PFF-exclusive takeaways from the contest for each team. Joe Flacco managed the game well for Baltimore. He didn’t turn the ball over, however he was unable to connect with any passes over 20 yards through the air. Most of his passing yardage came from the short game, as he completed 18-of-22 passes that were under 10 yards in the air. He was granted decent protection throughout the night by his line, having been under pressure on only seven of his 36 dropbacks. Austin Howard was strong in pass protection and did not allow a single pressure, leading to a grade of 84.7 in pass protection. Howard, like the Ravens offensive line, has had an up and down season, as he’s surrendered 21 pressures through 11 games. Baltimore’s lack of offensive weapons was obvious at times tonight as they struggled to push the ball downfield and sustain productive drives. 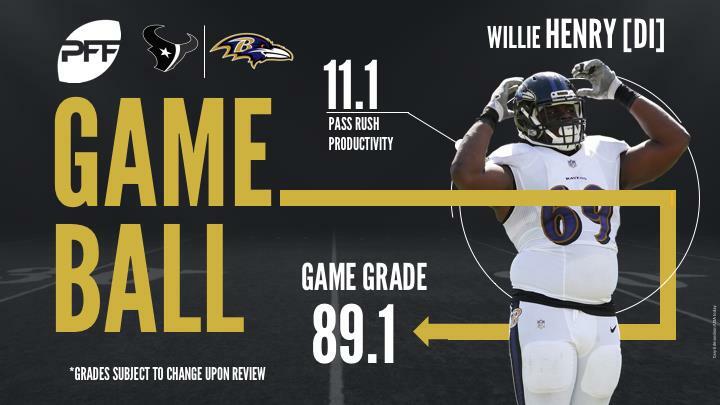 Henry did it all for the Ravens defense up front on Monday night, finishing the game with mid-80 grades in both run defense (86.9) and as a pass-rusher (84.0). The former fourth-round pick out of Michigan tallied four pressures on 27 pass-rush snaps (three hurries and a hit), batted a pass and snagged one run stop on top of it all. Henry was disruptive on the interior of the line all night long and he’s in the midst of a nice three-game stretch in what has been a solid debut season for the second-year player (he didn’t play a regular season snap in 2016). Tonight marked his third consecutive game with an overall grade of at least 80.0. The whole Ravens defensive front pretty much dominated the Texans offensive line tonight, with Suggs – and Brandon Williams – leading the way along with Henry. The future hall of famer led all edge defenders in Week 12 with eight pressures (six hurries and two sacks), with one of those being a strip sack to go with one run stop. Suggs has bounced back nicely this season after a bit of a disappointing season, by his standards, in 2016, he’s currently ranked 21st among edge defenders with an 84.6 overall grade this season. Oh what pressure will do to a quarterback. Savage was sharp tonight when he was given time to throw, completing 16-of-20 passes for 200 yards and a 108.3 passer rating when he didn’t have to deal with pressure. When the Ravens were able to get pressure though (something they were able to do on 19 of 39 dropbacks) he completely melted down, connecting on just 6-of-17 passes for 52 yards and two interceptions on pressured throws, good for a 4.7 passer rating. Hopkins hauled in seven of eight targets and earned 39 of his 125 yards after the catch, Tom Savage had a 118.8 passer rating when targeting his star receiver, he had a 45.1 passer rating when targeting anyone else on the Texans’ offense. Hopkins caught passes against three different coverage players tonight and five of his seven catches resulted in a Houston first down. The veteran cornerback was impressive in coverage and limited opponents to only two receptions on eight targets. Joseph was matched up against the speedy Mike Wallace often and effectively shut him down, allowing only one reception on four targets for 24 yards against him. All three corners for the Texans played well, as each had a coverage grade above 80.0. Clowney was a menace in the first quarter for the Texans, recording a tackle for loss, sack and hit on the quarterback. His play quieted down after that with credit due to the Ravens offensive line and coaching staff finding ways to neutralize him. When on his game, Clowney has shown flashes of being an impressive run defender and it was on display tonight. Clowney recorded a run-defense grade of 86.7, which was tops on his team.